Since meeting in 1971 and discovering that they liked to play the same old time music, Pop Wagner and Bob Bovee have produced some of the most spirited traditional music around. Separately and together, they've developed and deepened their old time craft during 40 years of their accomplished musical careers. Enjoy the show on Fri., Mar 29, at 7:30pm. Pop Wagner, master finger picking guitarist, fiddler and singer, square dance caller, and purveyor of dry humor, lives in St. Paul and performs solo and in various other musical combinations. Bob Bovee resides in the rural area of southeastern Minnesota. He performs solo as well as with Wagner, plays guitar, harmonica, autoharp and banjo, sings and yodels, and is also a humorist and storyteller. Together they have entertained audiences spanning America, Canada and across the pond, including the Winnipeg Folk Festival, the San Diego Folk Festival, the Five Colleges Folk Festival in Massachusetts, and four tours together in Europe. 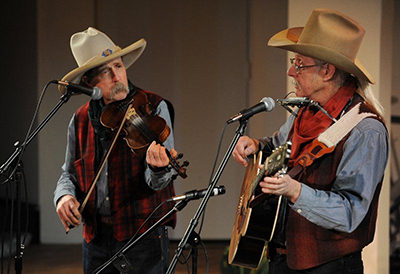 A Wagner-Bovee performance offers a generous dose of authentic cowboy songs, plenty of square dance tunes and other instrumental numbers, country blues, comic and sentimental songs of the south, and perhaps an original or two. The two are likely to also throw in a cowboy poem and some tall tales, along with history, folklore and jokelore. Bovee and Wagner have been frequent performers at such seminal Minnesota venues as the Coffeehouse Extempore, New Riverside Café, Cedar Cultural Center, Ginkgo Coffeehouse and Public Radio’s “A Prairie Home Companion”. Tours together around the U.S. have included shows in seventeen states, and a television program featuring the two aired in July, 2014 on Prairie Public TV from North Dakota. The duo also made its mark on the dance scene in the Twin Cities. In October of 1979 Bovee, Wagner and Matt Haney, with the encouragement of Gail Heil who moved to Minneapolis two weeks later, started the Monday Night Square Dance. The Monday Dance is key in the development of the old time scene in Minnesota that has spawned such a wealth of old time bands and dances, and Wagner and Bovee are still a pivotal part of this scene. Tickets are $20 in advance and $23 at the door.